CapeSym specializes in novel thermal management devices for removal of high heat fluxes. We have many years of experience in applying impingement cooling to challenging heat transfer applications, using micro-scaled devices such as micro-jets, micro-slots, and micro-channels to achieve high-performance, compact cooling in very challenging situations. An aerospace company that builds avionics to operate under extreme thermal load needed a mini-channel cold plate design. After trying unsuccessfully for a year, they turned to CapeSym for help. In less than two months, CapeSym experts redesigned the part to ensure optimal thermal performance. The part was successfully manufactured and testing showed that it exceeded operational requirements. In impingement the heat transfer coefficient scales inversely with the jet/slot size. Thus, by going to jets with diameters in the range of 100s of microns very high heat transfer coefficients can be obtained. 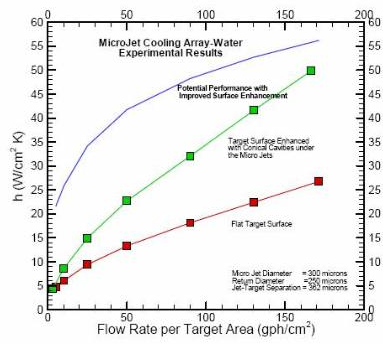 We have developed a microjet array (MJCA) that consists of an array of small diameter impinging jets which are packed very closely to each other. 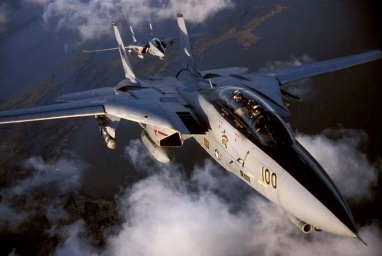 Each jet is surrounded by a number of return ports so that the return flow from each jet is exhausted locally. In this manner, each jet is effectively isolated from the neighboring ones, and the cooling effect of a single microjet is replicated over a large area. 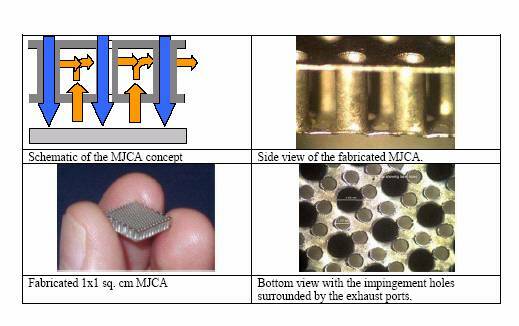 CapeSym's MicroJet Cooling Arrays (MJCAs) can be used with three forms of impingement cooling for different levels of performance. 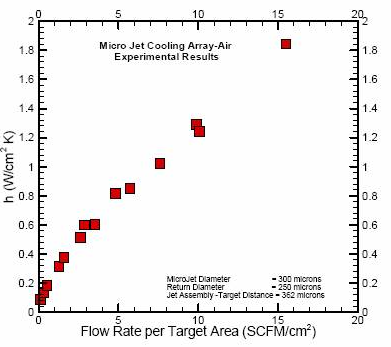 With the measured heat transfer coefficients, a micro-jet impingement cooling system can easily handle heat fluxes in excess of 1kW per square centimeter. Heat transfer coefficients up to 50 W/cm2 K have been obtained with water as the coolant. The microjets in these experiments were 300 μm in diameter, returns 250 μm in diameter, and the array was placed about 360 μm away from the target. Two sets of experimental results are shown in the adjacent figure, one for an unmodified target surface (red) and another with conical cavities fabricated under each jet (green). The modified target surface significantly increased the heat transfer coefficient, confirming our theoretical prediction. Fundamental considerations indicate that by varying the geometry of the cavities we can improve the performance of MJCAs further. MJCAs have also been tested with fluids other than water. The effect of fluid properties is well characterised by the laminar correlation for Nusselt number for laminar jets: Nu ~ Re0.5 Pr0.3. Air cooling has a number of advantages over liquid cooling: Air is readily available; leakage does not offer any hazards and does not damage neighboring devices; in some applications air can be exhausted into the environment obviating the need for recycling equipment; and air has a much wider operating temperature range than most liquids whose performance is limited to the range spanned by their freezing and boiling point temperatures. The thermophysical properties of air render it unsuitable for removing high heat fluxes with traditional approaches, but with impingement using MJCAs we have demonstrated heat transfer coefficients as high as 2 W/cm2 K. This capability significantly expands the levels of heat flux that can be handled by air cooling. 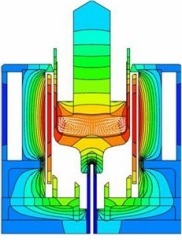 In general, heat removal systems that rely on boiling of a flowing stream of coolant, the so-called forced convective boiling, are characterized by very high heat transfer coefficients. Thus, for a given thermal load they can be made more compact (smaller surface area) and require smaller coolant flow rates than single-phase systems. The limiting factor in convective, as well as pool, boiling is the burnout (also called Critical Heat Flux, CHF) limit. This upper limit corresponds to the condition where boiling is so vigorous and the velocity of departing bubbles is so high that the liquid coolant cannot reach the hot wall and a vapor blanket is formed over the hot surface. The very low thermal conductivity of the vapor blanket results in rapid and dramatic increase in the temperature of the hot surface. In most physical systems the temperature increase can be as high as several hundred degrees, resulting in catastrophic failure. A typical value of CHF for nucleate boiling is about 100 W/cm2. In forced convective systems, this value can be increased with increasing flow rate. 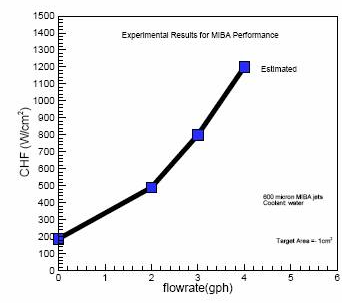 We have demonstrated that by using microjet impingement, the value of CHF can be increased substantially to above 1 kW/cm2 at extremely low flow rates. These results are shown below and indicate that impingement boiling can be effectively used for removing very high heat fluxes at fairly small flow rates. A major problem with testing devices for high heat flux cooling, is generation of heat fluxes in the range of 500-2000 W/cm2, that can be controlled accurately. CapeSym has developed a turnkey system capable of applying upto 2kW in a target of arbitrary size and shape. This device can accommodate liquid as well as gas coolants, and is fully integrated with data acquisition and control/measurement software. Thus,heat flux at the target surface, target surface temperature, flow rate, pressure drop and temperature rise of the coolant can be displayed in real time and logged. The hardware is built around a copper block with embedded heaters is used as the heat source. 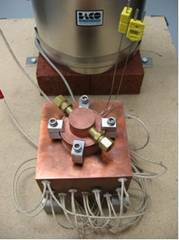 The cooling device is placed on the top surface of a copper post which is attached to the top of the heater block. Two thermocouples in the narrow region of the post are used to calculate the heat flux through the post, and thereby heat flux at the target surface. The T/C readings are also used to calculate the temperature of the target/cold plate interface. The top surface of the post can be machined to any arbitrary size and shape. The high thermal conductivity of the copper ensures that the heat flux across the target surface is uniform. The entire test assembly is contained within a vacuum chamber to eliminate heat leak by natural convection and to avoid oxidation of the copper surfaces. High heat flux setup with the MJCA housing bolted to the heater block. 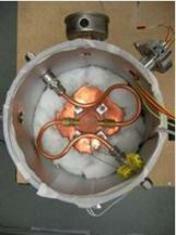 Aerial view of the heater block and MJCA housing inside the vacuum chamber. The post connects the target surface to the heat source. The target surface can have an arbitrary shape and size.